One of the biggest obstacles many people face when considering a water filter deals with their fear of the installation process. Most people simply do not see themselves lying under the sink getting soaking wet and messing around with foreign or strange tools as they fumble their way through installing a water filter. Thankfully, Leena, times have changed since times like those and installing a water filter does not have to take all day or require a master plumber with years of experience. Most relatively new homes have straightforward, easy to follow plumbing lines under the sink with shutoff valves on incoming cold water and hot water lines so hooking up basic undercounter water filters usually does not require the assistance of a professional. So… Have you installed one yourself? As a matter of fact, yes, we have. We installed one of the Austin Springs Undercounter Water Filters (Brushed Nickel Finish) under our kitchen sink… and the difference in water quality between water from the regular faucet and the filtered faucet blew us away. Why did you install a water filter? We knew that we had fluctuating levels of chlorine in our regular tap water (chlorine testing told us that) and found our water tolerable all the time, but not necessarily likable all the time. Regular testing of our tap water’s pH and Alkalinity also revealed substantial fluctuations (which we corrected in our showers by installing Austin Springs Shower Filters) so we figured it wise to normalize those for our drinking water, as well. 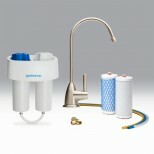 As we said before, and will say over and over again, testing your water prior to selecting a water filter will keep you from possibly choosing the wrong filter for the job… and THEN imagine the aggravation you’d feel after installing a water filter — REGARDLESS of how easily the filter installed! So… Was installation of the Austin Springs unit easy? We live in a relatively new home so we encountered no problems whatsoever. The Austin Springs Countertop Water Filter came with easy-to-follow instructions and all the parts required (except for a pair of regular pliers) to get the job done. Any problems installing the Austin Springs unit? The filter and accompanying faucet gave us no troubles… but getting around the garbage disposal during the installation process did prove a bit tricky. We can’t blame that on Austin Springs, though! Correcting Shower Water Problems — Test the Water First! This article comes from our own personal experience and involves shower water that caused dry, flaky and sometimes itchy skin. Each time we visited a family member’s home our children’s skin got really dry… and so did ours. We knew immediately that the water which the family member said had no issues that would cause the conditions we experienced — did actually have an issue. We suspected chlorine as the skin irritant (due to our having to remove it from the shower water at our own home) and performed water testing using the COMPLETE Water Quality Test Kit to try and confirm our suspicions. To our surprise, we did not find anything terribly out of line regarding the water’s chlorine content but we DID find that the water had unusually high pH and total alkalinity levels. Had we not tested, we would have installed a filter geared more towards chlorine removal and possibly wasted our money! So what did we end up doing? At home we previously installed shower filters using the Austin Springs Premium Shower Filter (after doing water testing, of course!) to correct higher than desirable chlorine levels in our shower water. We noticed a positive change in the water almost immediately. The chlorine smell went away, soaps lathered up better, and the water seemed to take on a sweeter taste. In that case we knew we would need a shower filter designed more for chlorine removal (hence the reason we opted to install shower heads that utilized Austin Springs Premium Shower Filters) but at our relative’s house we believed the issue dealt more with the pH and alkalinity of the water — despite neither parameter’s test value having strayed too far away from the norm. The next time we visited our family we installed the Basic Austin Springs Shower Filter and immediately noticed a change in shower water quality. The water felt less ‘abrasive’ and we none of us needed to slather up with several layers of moisturizing lotion after a shower. Testing your water (or a family member’s water) before selecting a water treatment option empowers you with the ability to correctly pick the water quality improvement device best suited for your unique water quality situation. NOT testing the water before picking a water filtration device may result in a person installing a water filter that will not directly address the water quality issue at-hand… and that means money wasted on a solution that solves nothing. Simply taking a few minutes and performing simple at-home water testing may save you hundreds of dollars and hours of aggravation! Health and safety experts in the EA claim the levels detected pose no danger to the environment or humans… but other folks, like ourselves, believe the introduction of ANY foreign compound into the environment or human body poses, on some level, a risk. Where did the pesticides come from? As we mentioned earlier, pesticides (in this case slug poisons) use metaldehyde. Farmers distribute pellets containing metaldehyde around their crops to keep slugs from destroying their plants. Heavy rains in recent times resulted in greater than usual amounts of runoff carrying slug poisons (and other agricultural matter) away from agricultural areas and into bodies of water. Then, after the rains stopped, farmers needed to re-apply the slug poisons to protect their crops from slug damage… and the cycle started over again. Why not just ban the use of metaldehyde? Some environmentalists argue that a MUCH better slug preventative exists and has ALWAYS existed. Creatures like hedgehogs, frogs, toads, wild birds, predatory nematodes, and carabid beetles whose numbers have dwindled (as a result of mankind’s actions!) love to munch on slugs! By re-introducing more natural predators of the slug into the picture environmentalists theorize that farmers could become less reliant on poisons that contain metaldehyde. Whether you live in England or Wales where slugs need killing or near the Mississippi River where nitrate levels have risen this year, the risk of drinking water contamination as a result of runoff will always exist. That fact alone should make each and every one of us want to stay vigilant and monitor the quality of the water we drink. Injecting Acid Into the Ground to Extract Gas/Oil — A Good Idea? Does injecting 1,000’s of gallons of hydrochloric or hydrofluoric acid into oil or gas wells sound like a good idea to YOU? It certainly does NOT sound like a well though out plan in OUR minds! Experts in the gas and oil extraction industry refer to the practice of pumping huge volumes of acidic solution(s) deep into the ground for the purpose of liberating fossil fuels as ‘acidification’. Would it shock you to learn that this fossil fuel extraction technique, much like hydraulic fracturing, has very few regulations governing its use? In fact, one could argue that the oil & gas industry as a whole right now has very few regulations governing its behavior… but we prefer to leave those sorts of discussions to folks far better versed in environmental law. From what we have read so far, the acid dissolves weaker, less dense areas of underground shale formations and creates new pathways through which highly prized fossil fuels find their way into a gas/oil well’s collection apparatus. First, let’s briefly discuss the possible harm that acids may do to a person: 1) burns; 2) skin, eye and respiratory irritation; 3) skin, eye and respiratory irritation damage; 4) consumption may result in permanent organ damage; 5) extreme exposure may result in death. Large amounts of corrosive material would need to get hauled up to well pads and drilling areas by truck and a simple traffic accident would have devastating effects on anything immediately around the crash site. That same large volume of corrosive materials would need to get stored in tanks at the well pad before use and a simple plumbing failure could result in a leak that allows environmentally hazardous material to flow freely into the environment. Although some experts in the field of oil extraction have claimed that nearly all of the water/fluids forced into the ground get recovered and that any remaining traces do no harm to the environment, we believe ANY remnants of hazardous materials in the ground sounds like too many. As with hydraulic fracturing, we have only just BEGUN to do in-depth testing to determine the long term effects of gas/oil extraction activities involving acidification. And finally… what will happen to the waste water stream once pumped back to the surface? How and more importantly WHERE will all of that tainted, and quite possibly very corrosive, water get reclaimed? Will the gas/oil companies have to truck all that stuff back through the countryside and (again) risk a simple traffic accident that could send thousands of gallons of highly polluted water rushing unchecked into the environment? In all honesty, we barely touched on the topic of acidification — because of our current lack of knowledge on the topic — so if you would like to learn more, please read an article called Beyond Fracking: Is California Being Pumped Full of Acid?. It does a good job of explaining the process without getting too technical and also discusses the history of acidification in California as well as the efforts of some to pull in the reigns and put an end to acidification in California. If you read the article we linked to above you will learn that acidification did not start yesterday. It actually started quite a while back and for the most part it took place under a veil of secrecy. For the longest time it seems as though no one required the gas/oil companies to disclose all the details of how they went about the business of getting fossils fuels as long as the fuels kept flowing and they paid their tax bills promptly. This means, just like in most other situations where water quality for the masses butts heads with the interests and profitability of big business, the TRUE responsibility for making sure safe drinking water flows into a home falls on the shoulders of the homeowner. For that reason (and a host of others) we, like so many others in our industry, suggest that owners of private wells have their water tested by a qualified, certified drinking water testing lab at least once a year — and more frequently if naturally occurring events (i.e. flooding, drought, etc.) or events caused by man (i.e. hydraulic fracturing, acidification, etc.) take place near a drinking water well. Can Water Quality Affect Seasonal Allergies? Today’s question deals with seasonal allergies, a topic that affects millions of unfortunate souls each year… including yours truly. As the weather warms up and the pollen comes out, so do the Kleenex. Thank you for the inquiry, Rocker. Until about a year ago I had never heard of a term called ‘allergy stacking’ which means that a person can have slight to mild allergies to things in their environment and never really suffer the effects of a pronounced allergic reaction until they become exposed to a number of those things at the same time. As an example, let’s say Rocker has a slight allergic reaction to cat fur and also to the pollen of a Maple tree. When exposed to either he shows little or no symptoms. However, when exposed to them both at the same time he begins to sneeze his head off and break out in hives. What does ‘allergy stacking’ have to do with water quality? We figure that since the human body naturally mounts a defense against and reacts to unwanted contaminants in the air, it would also do the something similar for contaminants in the water we consume. Therefore, it stands to reason that drinking water contaminants to which the human body reacts and quickly wishes to get rid of may contribute to the body’s overall allergen load. Although Dr. Jerschow’s research did not find a cause and effect relationship between the pesticide ingredient and food allergies, it does certainly lend a great deal of credibility to the notion that all the pesticides, VOC’s (volatile organic contaminants), and other contaminants many of us ingest on a regular basis in our water have an adverse effect on our health. Shower Filters – We carry the Austin Springs brand of shower filters that have tested to reduce chlorine concentrations by more than 90%. Studies have shown that exposure to chlorine — which easily off gases from warm/hot shower water — can trigger mild to occasionally severe allergic reactions and may potentially cause long term respiratory problems. Countertop Filters – At this time we have Austin Springs‘ NSF/ANSI 42 and NSF/ANSI 53 Certified counter top water filters. In total, these units are NSF Certified to reduce more than 60 water contaminants including chlorine, chloramines, mercury, cysts, various gasoline additives, volatile organic compounds (VOC’s), lead, etc. 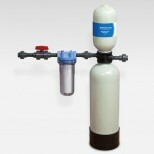 Undercounter Filters – Using the same filter elements as the contertop models, the Austin Springs undercounter water filters also bear NSF Certification for the reduction of more than 60 water contaminants including chlorine, chloramines, mercury, cysts, various gasoline additives, volatile organic compounds (VOC’s), lead, etc. This year’s simple pool test kit lineup includes the Pool Check 3-Way, 4-Way, 5-Way, and 6-Way test strips. We also carry the Taylor Basic Phenol Red (pH) & OTO for Total Chlorine (K-1000), Taylor Basic Phenol Red (pH) & DPD for Free Chlorine (K-1001), and the Taylor Troubleshooter (K-1004) test kits. No matter which test kit you select, please keep in mind that a test kit will do you absolutely no good if you never use it. Also, waiting until a problem starts to develop before you test will also do you no good. Pool water testing alerts you to water quality deficiencies that could result in water quality issues (i.e. cloudiness, algae, stains, etc.). Catching the deficiency before it turns into a problem can save you hours of aggravation and quite a bit of money in chemicals that treat algae, cloudiness, staining, and other water problems. Calcium Hardness: 180 – 220 ppm, though some say 200 – 400 ppm for plaster and/or gunite pools.. Please note, however, that not all pools will require the exact same water chemistry to stay safe for swimming and crystal clear so if you have doubts about specific pool water quality concerns, definitely get in touch with a pool water professional (i.e. service company or staff in a local pool store) before adding water treatment chemicals. Adding the wrong chemicals can make a problem much worse and often times a lot more expensive to correct! As more and more requests for us to carry new products come in we do our best to oblige each and every one — except for the requests involving test kits for things like goat’s milk, chemical compounds we can’t even pronounce, human DNA in food (gross! ), and other interesting things some of our readers said they wanted to test for. Most recently we added two new test kits that MANY of you have asked for: The WaterSafe Lead in Water Test Kit and the WaterSafe City Water Test Kit. We think these two test kits bring a lot to the water testing table in terms of utility, ease-of-use, accuracy, and affordability. 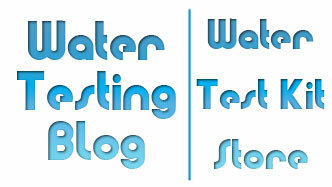 Look for us to begin carrying more of the WaterSafe Brand in the new near future! By now you have undoubtedly seen us mention a new product line that we will begin carrying in just a few days now called Austin Springs Water Filters in recent articles — and you will see us bring it up more and more as the official company release date gets closer. 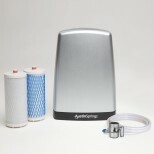 If you have considered putting a water filter in your home — after testing your water to make sure you actually need a water filter, of course — we highly suggest taking a look at the benefits offered by the Austin Springs line of water filters which include NSF/ANSI 42 Certification for chlorine reduction (countertop, undercounter & whole house) as well as NSF/ANSI 53 Certification for the reduction of unwanted water contaminants like VOC’s (volatile organic compounds), lead, cysts, mercury, MTBE (a gasoline additive), asbestos, and turbidity (countertop & undercounter). 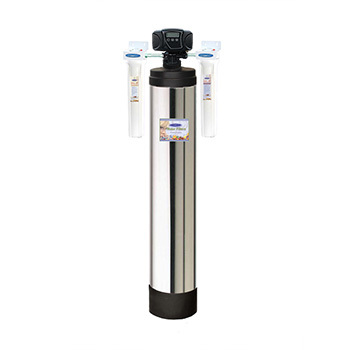 With pricing in a range that most home and small business owners can certainly afford and benefits that most people can use, we believe the Austin Springs product line will quickly become one of te most sought after brand names in the point of-use water filtration market! 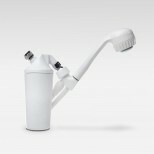 Interested in learning more about Austin Springs water filters? You will find information on them in our online store (Shop.WaterTestingBlog.Com) and in the following data sheets: Austin Springs Countertop/Undercounter Data Sheet & Austin Springs Whole House Water Filter Data Sheet. Over the past few months we also added new water testing products from the SenSafe and WaterWorks brands of water test strips for ozone, hydrogen peroxide, chlorine dioxide, high range free chlorine, high range total chlorine, and iodine — and we hope to have even more oxidizer testing products available in the next few months! As happens in ANY retail business where products have assigned shelf lives, invariably some products don’t sell as quickly as store owners would like… and since we hate to see perfectly good water test kits go to waste, well, we created a special clearance section where you will find water test strips and water test kits whose shelf lives have become short offered for drastically reduced prices. So, if you find yourself with immediate testing needs and you won’t need test strips with longer shelf lives, definitely take a look at the current offerings in the Water Test Kit Store Clearance Section! Confusion over which water treatment option will work best for a particular application will always exist so if you find yourself somewhat overwhelmed by the huge number of water filters on the market, you find yourself in the company of millions. Drinking water contaminants and water quality characteristics vary across a water distribution network, from neighborhood to neighborhood — and even from residence to residence depending upon the age of the residence and each residence’s type of plumbing in-home and connecting the home to the public water system. Hi, we just bought our first house (near Cincinnati OH), a long home, with a well. When we first had the water tested while under contract it was during the rainy season in the spring so we were told that having 1 coliform bacteria unit was no unusual. Regardless, we bought a UV for that. We moved in in August and found that a water softener had been used on the house during the testing, so since then we have discovered iron, lot’s of iron and iron bacteria and slippery total solids (please correct that last bit!). We are using bottled water until we figure out which solutions are good for us. There are so many systems out there, we can’t decide what we really need! First off, it seems as though Katherine has already gone and had her water tested by a certified water testing laboratory — and we think that a very wise move on her part since one must know what contaminants need removing before he or she can make an educated decision regarding a water filtration system. While not bad enough to make the EPA’s Primary Drinking Water Standards list, iron in drinking water can create a host of problems for people in the form of unwanted staining, unpleasant tasting water, discolored water, and clog forming iron deposits. 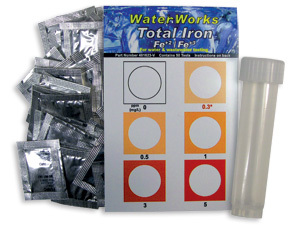 One can test for the presence of (ferrous & ferric) iron using a simple total iron test kit which allows users to test for total iron levels between 0.3 and 5.0 mg/L (ppm) in a matter of minutes. Or, if one suspects a serious amount of dissolved iron in their water, the Ida’s Iron Check made by WaterWorks has the ability to detect concentrations of dissolved iron as high as 50 ppm in a short period of time and without complicated laboratory equipment or specialized training. OK, so now you know you have iron. How does one get the iron OUT of drinking water? Very few situations in drinking water remediation (the correction of water quality issues) have simple solutions and every water quality situation presents a unique challenge. Therefore it stands to reason that not every water treatment system will have what it takes to correct every possible water quality problem. Based upon your water test results, carefully read through the specs of various water filtration devices to make certain the unit you select will remove the amount of iron and type of iron present on your water. Can I use a water softener to remove iron? Despite what some folks may tell you (while trying to sell you a water softener), you should not attempt to use a water softener as a line of defense against iron in water. The iron will clog the softener and cause the unit to need much more frequent regeneration, backwashing and service visits — all of which wind up costing YOU more money. For more information on why you should not use a water softener as a filter for iron we suggest taking a look at an earlier article we wrote called Can I Use My Water Softener as an Iron Filter?… and then not use your water softener as an iron filter. What iron filter would you recommend? Obviously, since we work closely with both Filter Water and Filters Fast, we suggest beginning your search with either one of those companies. 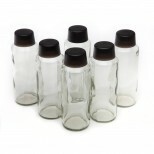 No matter what filter system you decide on, make SURE it comes with a sediment pre-filter. Otherwise you will find yourself having to backwash your iron filter a lot more often than you’ll enjoy! Can I Use My Water Softener as an Iron Filter? In this day and age where virtually, and sometimes literally, every penny counts in a family’s budget, finding ways to save money matters — but when it comes to investing in your family’s safety through the use of a water filter, make certain you purchase and install the correct filter(s) for the job at hand! While a water softener typically does have the ability to remove some amount of dissolved iron from water, the act of removing iron can do serious damage to the mineral bed designed specifically to reduce water hardness. If pressed to remove iron on a regular basis the damage can eventually add up… to the need for an expensive service call by water filter technician. Another way to think about it: Asking a water softener to do anything other than remove water hardness lessens the device’s water softening efficiency, interferes with the proper operation of the device, typically causes damage to the device, results in higher than normal consumption of salt by the device, and may result in your having to pay someone to come out and repair your softener after its adsorption media gets plugged up with iron. When attempting to turn a screw would you A) Hit the screw w/ a rolled up newspaper; B) Use an app on you iPhone; or C) Turn the screw with a screwdriver. Hopefully you chose ‘C’ just now. The same sort of logic applies to water filters, as well. 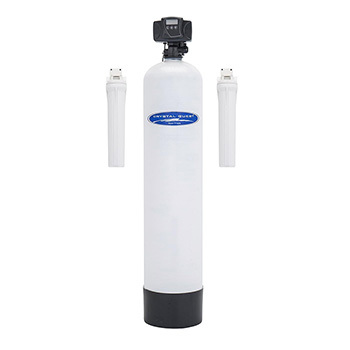 Filter Water, an online vendor of drinking water filters we recommend on a regular basis carries several types of water softeners and homeowners can install separate inline iron, sediment, multi-filter, etc. cartridges to work in conjunction with the water softeners Filter Water carries. Chlorine taste and/or smell in drinking water — very few people enjoy it. In fact, of all the complaints we hear most from customers of city/municipal water suppliers, it tops the list darn near every time. By law public water systems must treat water for unwanted biological contaminants and for the most part pretty much all of them use some form of chlorine as part of their disinfection process. Also by law, water may not leave their facilities containing more than 4 ppm (parts per million) free and/or total chlorine. Want more information on the difference between free and total chlorine? Take a look at an earlier article entitled Free Chlorine, Combined Chlorine and Total Chlorine. Getting back to Diane’s question, though, a water supply could very well contain under the allowed level of free and/or total chlorine — and still smell and taste really bad. 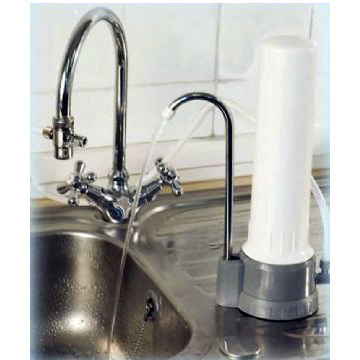 For most folks removing the chlorine taste and odor from their drinking water begins and ends with the installation of a Granular Activated Carbon (GAC) filter as a countertop water filter, faucet filter, undersink water filter, or whole house water filtration device. 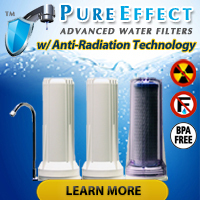 For others, however, the reduction and/or removal of chlorine taste and odor requires the installation of a granular activated carbon water filter as well as a more sophisticated water filter like a reverse osmosis water filter that more or less strips EVERYthing out of water… and for that level of filtration one typically will need to spend a few extra dollars. Two main types of chlorine to test for? In order to determine which water filter will best address your chlorine in drinking water reduction/removal needs you will first need to determine whether your water supplier uses free chlorine or chloramines as its main disinfectant. For that task we have found that the WaterWorks 2 Free & Total Chlorine Test Strips works quite well since it tests for both free and total chlorine at the same time. Upon completion of testing, simply subtract the free chlorine reading from the total chlorine reading to get the chloramine concentration. If you obtain a value the same as, or very close to, the total concentration (i.e. the free chlorine test pad reads zero) then your water supplier more than likely uses a process known as chloramination as it primary disinfecting method — and you will need a more sophisticated filtration system to get rid of the chlorine taste and odor.